The Auburn Animal Center adopted a desperately injured shelter dog and is raising money for her specialized care. AUBURN — When Tiny Tot was brought to the Greater Androscoggin Humane Society in Lewiston, the 5-year-old, scruffy, mixed-breed dog could not walk and was in so much pain she screamed. Shelter workers rushed her to the Auburn Animal Center, the local veterinary hospital that often took care of the humane society’s animals. Even the people there — professionals who commonly see pets in distress — were upset at her condition. 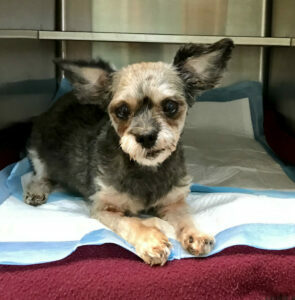 Almost a month later, Tiny is stable, her condition managed by steroids and pain medication. She can move around, she is not in much pain and her Yoda-like ears perk up. But she is not cured. That will take an appointment with a veterinary neurologist, special testing and, possibly, surgery. And it will cost, likely, several thousand dollars. The Auburn Animal Center formally — if temporarily — adopted Tiny so the nonprofit shelter would not have to be responsible for her. The vet hospital is raising money for her upcoming neurological care. With a single Facebook post and a GoFundMe page, it has raised more than $2,600 in two days. The hospital hopes to raise another $4,400 to meet its $7,000 goal. Little is known about Tiny or what happened to her. She was surrendered to the Greater Androscoggin Humane Society by people who said she had not been able to walk for three days and was not eating or drinking, according to Davison. They said her name was Tiny Tot and she was 5 years old. That was it. “I don’t know if they knew what happened,” Davison said. Kinney is uncertain what happened to her. Her spine was somehow injured, substantially. “It appeared from plain radiographs that it was probably the area where the head actually attaches to the spinal cord. It looks like there had been some damage there,” Kinney said. Kinney cycled through a variety of medications before recently hitting on a steroid that seems to be helping. But at least twice before, her condition has improved only to worsen again. “We take away some of the inflammation, we remove a great deal of her pain, but then she wants to do a little more than she should be doing, I think. Then we start to lose some ground,” Kinney said. Tiny has an appointment with a specialist in Scarborough in April. She is also on the waiting list in case there is a last-minute cancellation. The neurologist’s consultation will cost several hundred dollars. Specialized imaging will likely cost a couple of thousand dollars. Surgery, if needed, will cost several thousand dollars. While she waits for her neurology appointment, Tiny is living with Davison, who makes sure she is comfortable, medicated and loved. She gets her own sweater and blankets, as well as all the attention she wants. Davison said she is not planning to keep Tiny. One of Davison’s dogs died recently and she is not ready to get another. Once Tiny is better, she will be given to a permanent home. 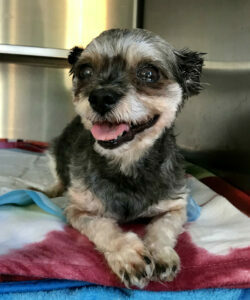 The hospital has already started getting calls from families interested in adopting Tiny. “I think that’s going to be the least of our problems, finding a forever home,” Kinney said. If Tiny does not require surgery, or if the hospital raises more money than is needed for her care, it has a plan for that, too. “Then that can go to the next animal in need,” Davison said.